For the brewery, see Chimay Brewery. 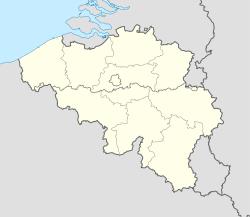 Chimay (French pronunciation: ​[ʃimɛ], Walloon: Chimai) is a Walloon municipality in the Belgian province of Hainaut. In 2006, Chimay had a population of 9,774. The area is 197.10 km² which gives a population density of 50 inhabitants per km². It is the source of the Oise River. In the administrative district of Thuin, the municipality was created with a merger of 14 communes in 1977. The Trappist monastery of Scourmont Abbey in the town is famous for the Chimay Brewery. The origin of the name is from the Celtic word coimos meaning "pretty, pleasant". The Walloon names of the place names are in brackets and italics. Chimay has traditionally hosted an annual motor racing event, run on a street circuit formed from local public roads. From the 1920s to 1960s the event was run for contemporary Grand Prix and sportscar categories, and included the famous Grand Prix des Frontières. In recent times, while the event has persisted it has been run for historic race series. The track briefly lost its licence in 2006 related to safety fears, but has since had it reinstated. Chimay Trappist beers and cheeses are produced in the town by the Chimay Brewery, run by the Trappist monks of Scourmont Abbey, and are internationally renowned. ^ a b Chisholm, Hugh, ed. (1911). "Chimay" . Encyclopædia Britannica. 6 (11th ed.). Cambridge University Press. p. 164. Chimay at the Union des Villes et Communes de Wallonie asbl.